A bunch of friends and I have recently been getting into microfinance through an organisation called Kiva. We’ve set up a little collective of people who lend money directly to some of the world’s poorest people to improve their outcomes. One such example is Mary Ayako Wambani from Majengo, Kenya who we’ve helped to raise $1,075 to extend her stock by purchasing two Friesian cows. 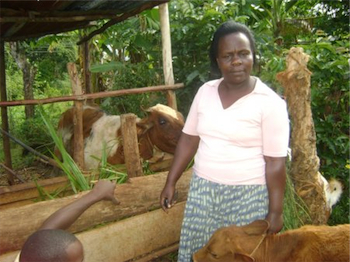 Mary owns a number of dairy cows which she uses to obtain milk to sell to her clients. Her clients mostly consist of the local hotels, shops and families in her neighborhood. Mary has been in KADET for a while now and has a good credit history. She hopes to obtain a loan to enable her to buy more cows due to the high demand for milk. She also hopes to buy a milk cooler for storing the milk as she transports it to her clients. Mary’s desire is to use the profits made to educate her children and improve her family’s living standards. She longs for the day when she will open a milk factory.